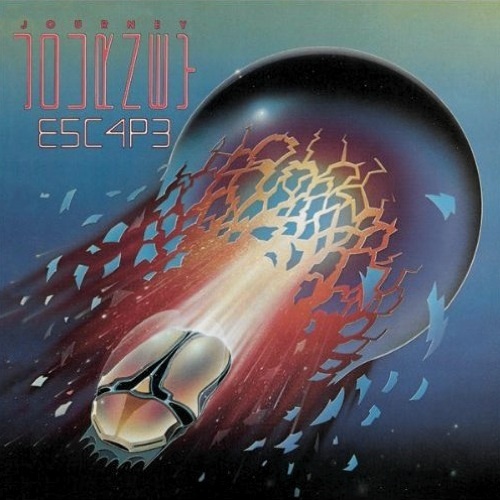 “Don’t Stop Believin'” by Journey is probably in the top tier of 80’s torch songs. Released in 1981 on Journey’s Escape album, it’s very much a part of pop culture, having been covered by numerous artists, featured in numerous movies and TV shows (The Wedding Singer, Family Guy, The Sopranos, Scrubs), and included as the climax of the premiere episode of Glee. It was written by Journey bandmates Jonathan Cain, Steve Perry, and Neil Schon. We’ll take a look at a few aspects of it that make it such a compelling song. First, it’s extremely simple. That brings to mind what Lionel Richie once said: that simple and iconic is what he aims for as a songwriter. The compactness of the lyrics is focused. “Just a small-town girl,” reads the first line. Five notes, five simple words, as casual as they are evocative. Not “She was just a small-town girl,” not “Hailing from the quiet part of town.” Just a small-town girl. That concise, compact trend is found throughout this song — no unnecessarily extra words. The same thing happens with “just a city boy”: simple and natural. Like the Lionel Richie reference above, I could play or sing just those five notes on the piano without words, and that would be enough to identify the song, because their simplicity has become so iconic in pop culture. The lyrics give us an outline of a scene — two lonely people with different backgrounds, hopping on a train going “anywhere” (what a poignant way to express their desire for change) — but enough is left to the imagination that, like a great novel, we’re left to paint our own visual picture of the scene, or where they might be going, or what their dissatisfaction might be. There’s something very interesting about the structure too. The first verse is a double verse and is pretty extended — by 0:49 we haven’t heard anything more than the intro and the verse. That’s a long time in a four-minute pop song to not offer any contrasts or given the listener something new musically. The same piano riff continues, so there’s clearly some musical tension building while the remainder of the scene is painted by the lyrics. The ear is wondering: when is this buildup and repetition going to break open into something new? 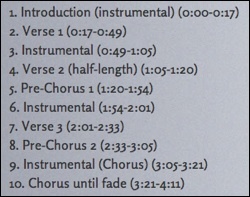 Following that is a prechorus (based on the IV chord, beginning at 1:22), but it leads back to another verse (a single verse this time), which means the tension build continues, since we haven’t reached the payoff moment — the emotional release that we expect by the arrival of the chorus. The second verse is no more intense than the first, but in the second prechorus there’s a little more drive from the band. Still, after the second verse and prechorus, it leads to a instrumental section, then, unbelievably, back for a third verse and prechorus and instrumental chorus, which gives us the chorus melody for the first time (3:06). Finally, after the instrumental — 3:21 into the song — we hear the chorus for the first time and we feel the emotional payoff of that very long build. That must be some kind of record. A special note about something I love about the drum pattern throughout the song: I appreciate that it’s not a stock beat with the kick on 1 and 3 and the snare on 2 and 4. Instead, drummer Steve Smith plays a low tom on beat 4 throughout, giving the overall feel of the song a slight hiccup as it moves forward then takes a step back. It never quite blossoms into a full-fledged standard groove; it’s always one snare short of that. It’s a refreshing touch that adds a timelessness to it. Even by the end of the song, when the chorus is repeated, that stop-go feel continues the sense of build and tension; we’re never relaxing into a traditional kick-1-3 and snare-2-4 groove. The tone of the bass guitar is unusual. It’s definitely played with a pick (listen for the very clear attacks), sounds like a fretless bass (unusual in rock), and has a heavy dose of a chorus/flanger on it (not atypical for 80’s music). Yet these quirks give it the character that doesn’t distract from the song, but has become part of the signature sound of the song. Great guitar tones, great vocal performance, great memorable keyboard, guitar, and drum riffs. It’s a classic all-round. For further reading, producer and author Bobby Owsinski offers some additional thoughts on this song on his blog.